After a fun weekend of hunting down Pandaren Treasures (and really, it’s a lot of fun) I finally found 20 lost treasures for the achievement and title. 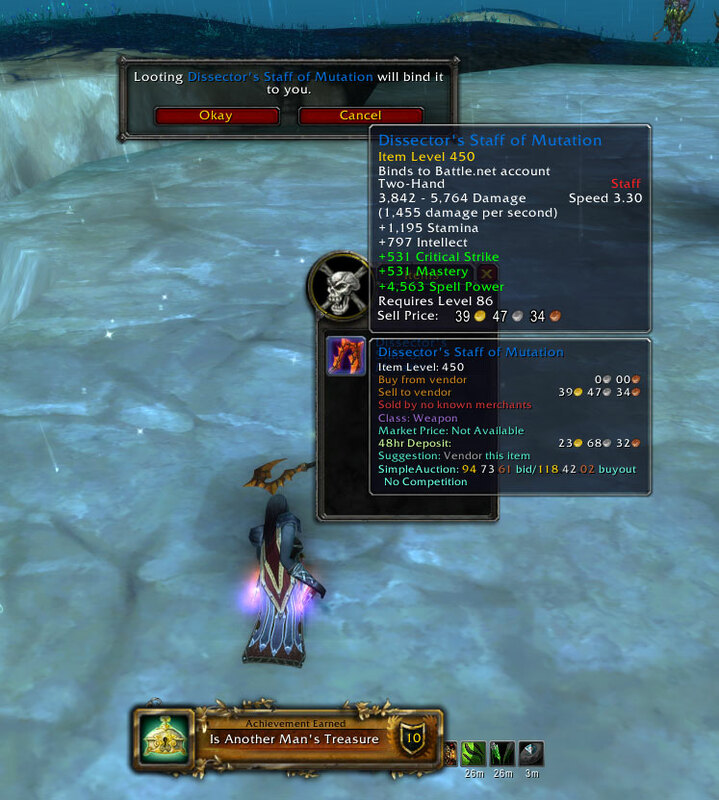 Other than the BoA weapons, I also snagged about 800g just from the Treasure vendor trash (averaging about 90-100g each), picked up a few BoP trinkets/rings/gear, and even had one very close call. Unlike hunting down rare pets that are an exercise in camping and frustration (I’m looking at you Minfernal!) Treasure Hunting (for me) was a good balance between rare spawns and timing that was challenging, but not punishing. Key words here are not punishing. Some treasures are more challenging to find because they are in “high traffic” areas for questing and dailies (there are still a couple I have to find yet) but at no point did I feel as if I had to plant an alt somewhere and camp for days. Looking for a treasure when everyone and his dog are doing dailies there? No problem – come back tomorrow when the quest hub changes and you’ll probably find it. Someone snag that treasure you’re after just as you spotted it? No problem – come back in a few hours or the next day and it might spawn again. Yup, that happened to me a couple of times. Someone grabbing the treasure seconds before I could get it, and to be fair well…I managed to beat out a Hordie or two myself. I followed this Exploration Guide: The Relic Hunter because it shows all the treasures you need for the achievements by zone. I did most of my Treasure Hunting with my Rogue. 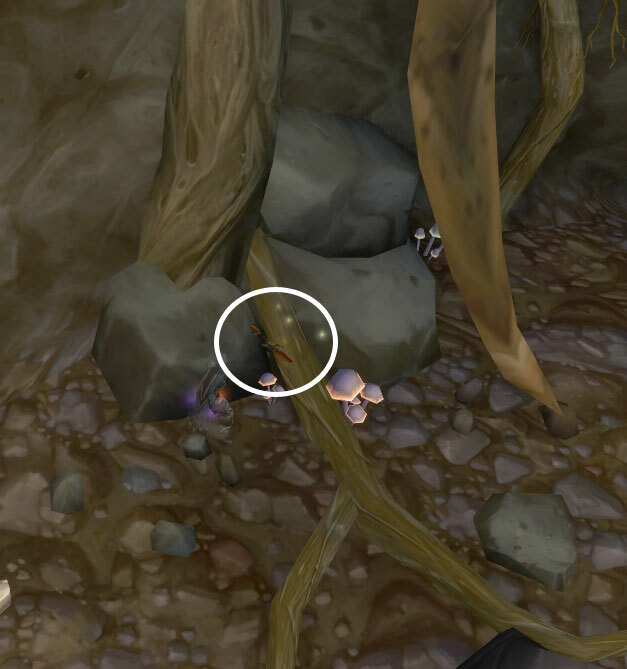 A lot of the weapons are very close to mobs and elite dailies bosses, so sneaky-steathly worked great to check to see if a spawn was there without having to fight my way in and out. If I decided to hang around for a while to see if something spawned, I could amuse myself by picking pockets and getting a little extra gold! Treasures will sparkle like quest items. Some are very obvious, out in the open or contrast well with the environment. 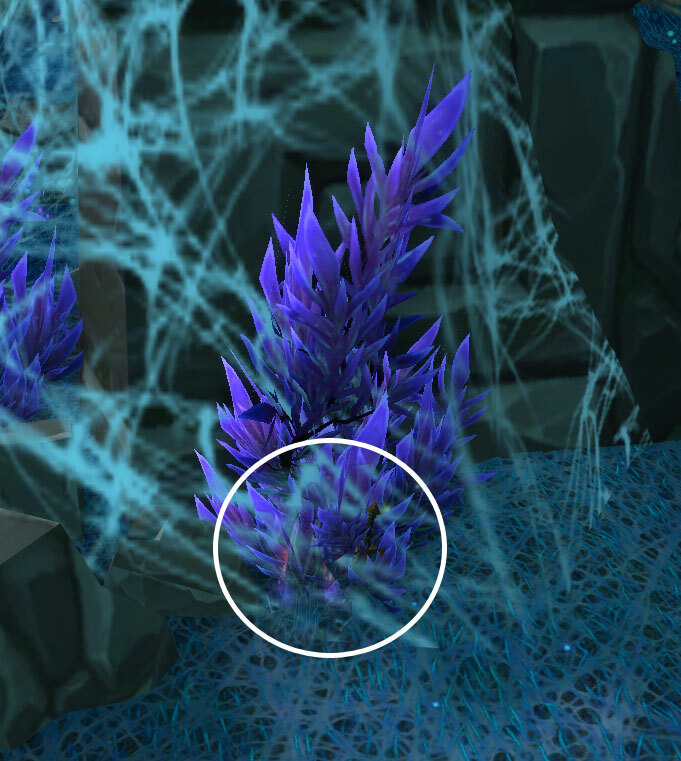 Others are really difficult to find and you have to look very carefully or run your mouse over a spawn area to find a cogwheel. 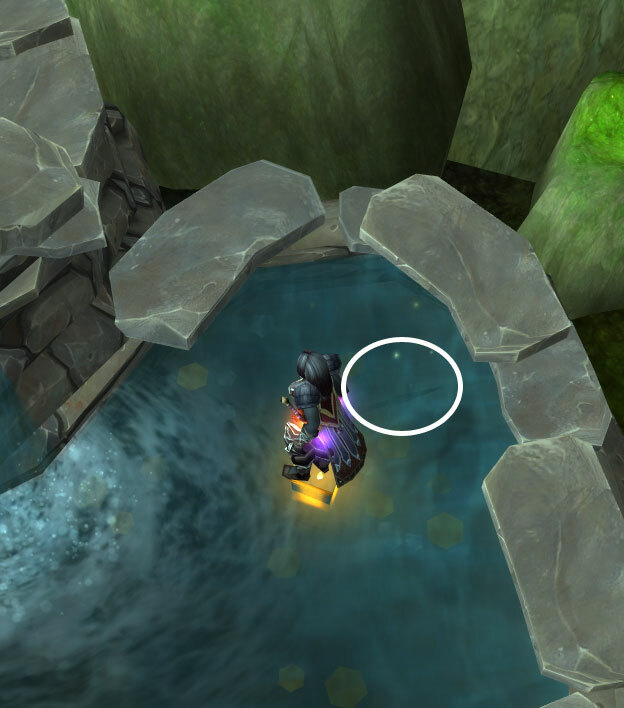 A couple of suggestions to make it easier – turn your water graphics to Low. This makes the water “invisible” and those underwater treasures a lot easier to see! Most important is to make sure you have room in your bags before looting a treasure – keep those bags empty! Some comments at WoWHead have reported that looting with full bags will not give credit for looting the item and it will not be mailed to you or restored – the item will just despawn and you are out of luck. After looking for this sword for a couple of days – it’s a very busy questing and dailies area – I had it spawn right in front of me while making my “treasure rounds” in Dread Wastes. 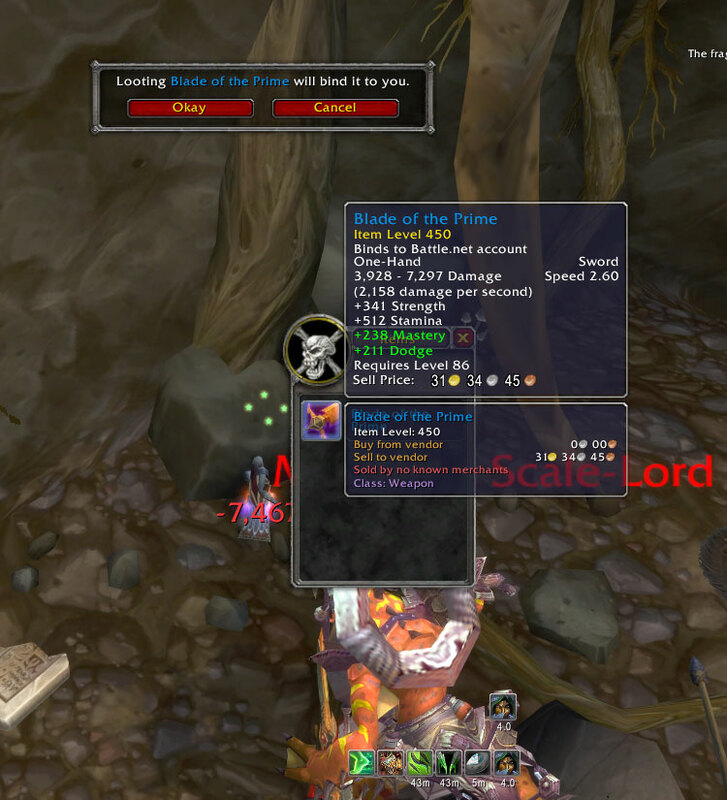 Of course, I unstealthed when I looted it, and aggroed the elite daily boss. Before I could hit Accept the boss attacked me, the loot window disappeared and the item despawned. Talk about a “bang my head on the keyboard” moment because this was one of the more difficult treasures to find (busy, busy area) and took about 3 days for me to see a spawn. Blade of the Prime Restored! Yay! The GM had me log over to Shadocat to make sure she got it, and there it was in the mail! I must have really lucked out and had the item logged as “looted” but I don’t think I would want to take a chance again. I don’t care how many elites are pounding on me – clicking that Accept button is Number One priority! Now, I still have a few treasures to find – particularly the Jade Infused Blade – but I’m patient. The only other question is…What the heck do I do with all those BoA Polearm Treasures? Haha – thanks! If I every get my baby Monk or Druid leveled up they’ll have a lot of polearms to use. I have to admit the sword is awesome looking i snagged that a few nights ago! I’ve been using a very simple addon – MapCoords – but TomTom is very popular and much more extensive. Grats on the title! Maybe if I stopped messing around with my alts, I could work on getting this title for Arv, lol. 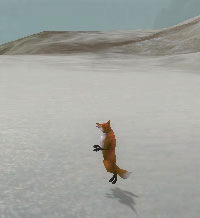 Hehe…any alts you have in Pandaria can treasure hunt because most of the treasures are in quest areas they are most likely to visit. 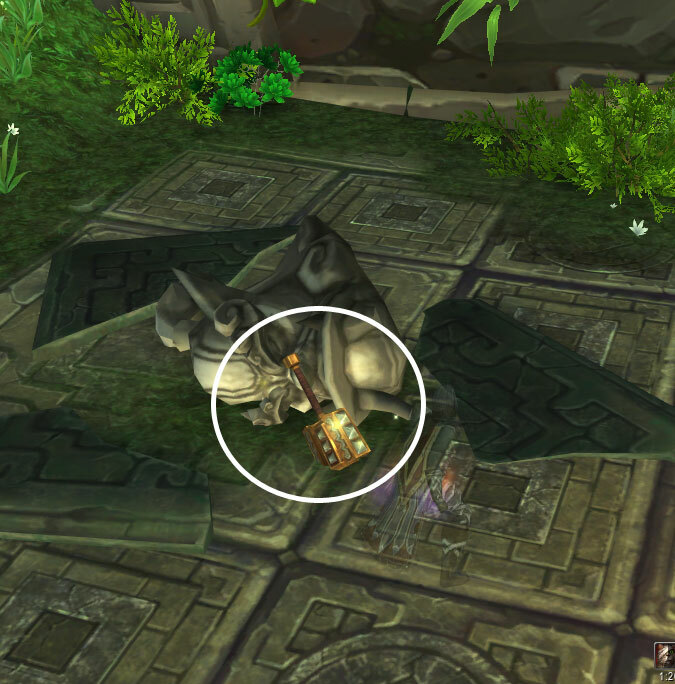 Probably why I haven’t found the Jade sword yet – it spawns at the Jade Witch’s house – who doesn’t go there while leveling? LoL! A lot of the BoP items are blue quality and would be very useful for a leveling alt – not to mention all the extra gold from treasure chests!